Killian, trying to wrap his mind around the friendly stranger showing him strange things growing out of a cardboard box. The single best thing about building Grommet has been watching the ongoing success of our Grommet partners, like Back to the Roots Ventures. The founders are two young guys who came up with the idea to recycle coffee grounds into mushroom growing kits. I took a road trip to visit them at their Oakland CA facility, with my two-year-old nephew Killian in tow. Community outreach is a big part of their ethos at BTTR, so the team was most welcoming to a little boy. Before our arrival, we negotiated our car around a live police sting operation (seriously) to get to the Back to the Roots office and manufacturing facility. Killian was not impressed with the Oakland Police Department activities, but this little red front loader going into Back to the Roots really got him going. Our host for the tour, Mai-Ling Garcia, is in charge of their direct to consumer (as opposed to wholesale) operations. She is standing in front of a bunch of BTTR mushroom growing experiments in this photo. I guess you could call this area their R & D lab. It was fun to see the original Back to the Roots boxes. It’s come a long way! These older versions do not communicate enough value or enable gifting. With Daily Grommet’s video format we can work around compromised packaging, but it is a very real problem when the Grommets get send out “into the wild” to compete on store shelves. Visible behind the green packages are some cool hydroponic experiments happening. This is part of BTTR’s mission “to make food personal.” I.e. they are working on bringing production into the home in all kinds of ways. This is Nikhil Aurora, co-founder, with the rest of us. (The man sports a constant smile!) I was lucky to catch him, as he had unexpectedly pushed back a trip to D.C. Nikhil was headed there in a few hours because he and his co-founder were scheduled to receive a big deal White House Empact100 List award. Here’s the reason why Nikhil delayed his trip: he had a last minute command-performance meeting with the Peets Coffee retail team at the BTTR facility. This meant a lot to me because my sister Lisa runs supply chain operations for Peets. In a bit of serendipity last year, I connected her with Nikhil to help BTTR increase its flow of used coffee grounds from Peets’ coffee shops. I love when we can pitch in and help break a log jam for a Grommet partner, by virtue of our networks. In this clean room is the man who expertly blends the mushroom spores, coffee grounds and growing medium to create each hand-packed kit. BTTR is on track to hit $5M in revenue in 2012. Their holiday ramp-up is yet to start but here are hundreds of kits “aging” before they are sent out for distribution. It’s so great to see where these hard-working entrepreneurs have taken such an improbable idea. I look forward to seeing what Nikhil and his co-founder Alejandro Velez do next. Whatever their new product might be, the Grommet community will be very interested. This is Killian saying goodbye to the BTTR team…who all work out of this same turquoise colored room partitioned off from the production facility. Finally, here is the original 2011 video we produced about Back to the Roots mushroom growing kits. 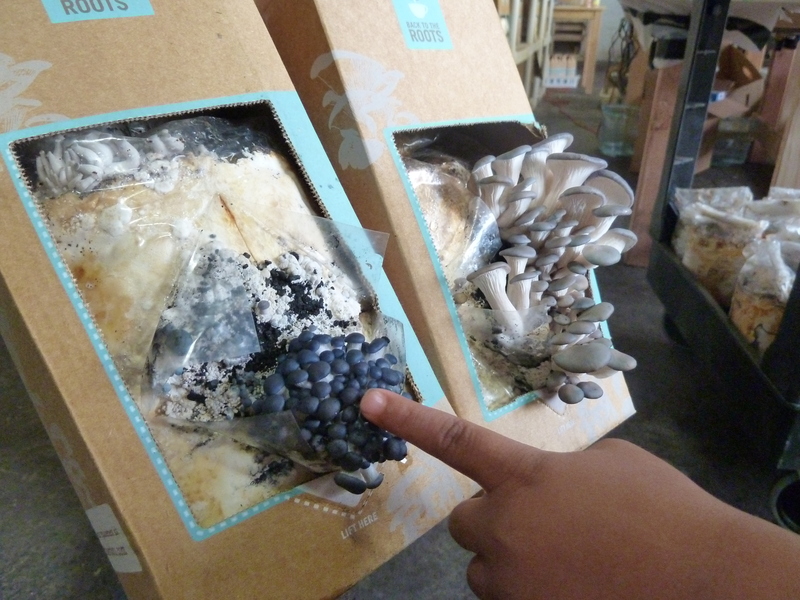 They keep on selling, the mushrooms keep on growing, and BTTR is really making food personal.